"It was an accountant, knifed in the belly. I wonder whether I killed him." Buffet Froid ("Cold Cuts," roughly translated) is a bizarre, dark comedy from French filmmaker Bertrand Blier. Gérard Depardieu stars as Alphonse Tram, an unemployed man whose lost knife turns up in the bleeding belly of an accountant he attempted to befriend a few hours earlier. Alphonse tries to bring the matter to the attention of his neighbor (the apartment building's only other tenant), a Police Inspector named Morvandieu (Bernard Blier), but he shows little interest. The following evening, his wife fails to come home from work, and her dead body is discovered in a vacant lot. The murderer (Jean Carmet), who is afraid of the dark, turns up at Alphonse's door while he is having a drink with Inspector Morvandieu, and the three become friends. When the trio is hired to perform a "hit" on a government official, the victim turns out to be the man who hired them; in the confusion, he is accidentally killed, and his widow moves in with Alphonse. From here, the situation only becomes stranger and more confusing, until Alphonse stands alone to confront his fate. Writer/director Blier constructs this farcical adventure out of bits and pieces of thrillers past, upending the clichés and confounding audience expectations at every opportunity. But Buffet Froid is more than a simple satire of a genre ripe for parody; there's a nasty, cynical bent to the humor, and more than a little bite to the dialogue. Blier's characters live in a world of physical and moral emptiness, where the coldness of the "monstrous, soulless city" turns its inhabitants into casual killers preying on resigned, relieved victims. Characters engage in long, Edward Albee-esque discussions about loneliness and violence, but they seem powerless to overcome their basest impulses. The police don't care about catching murderers; in fact, nobody seems to care about anything, least of all matters of life and death. This all sounds more depressing than it is onscreen. Alphonse, his wife's murderer and Inspector Morvandieu become something like the Three Stooges of the Apocalypse, whose comical adventures involve shootings, heart attacks, lecherous doctors, an army of Keystone-ish cops, and a professional killer. There's plenty of comical action on hand, and Buffet Froid is quite entertaining while it lasts. 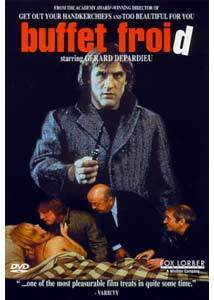 Blier's ideas have merit, and Depardieu does a fine job as the bewildered, unassumingly violent Alphonse. But the amorality and disposability of Blier's characters keeps the movie from having a lasting impact. We're invited to wonder whether Alphonse's adventures are the result of conspiracy, fate, or something darker and more treacherous; but in a film where the "what" seems so random and fatalistic, the "why" barely stirs a passing thought. An interesting but not entirely successful effort. Image Transfer Review: Fox Lorber presents Buffet Froid in its original 1.66:1 widescreen theatrical aspect ratio, though the nonanamorphic transfer leaves much to be desired. It appears that the process began with an analog, laserdisc-quality source—it's a 30-frame-per-second video master, with inherent interlacing artifacts, abundant edge enhancement and a "soft" look overall—and deteriorated further in the digital authoring stage. The DVD presentation is rife with jitters, odd horizontally rippling instabilities, and pulsing I-frame compression artifacts. The underlying image features decent shadow detail and naturalistic color, but the transfer doesn't do it justice—this release could have looked so much better than it does. Audio Transfer Review: Buffet Froid retains its original monaural theatrical soundtrack, presented in Dolby Digital 2.0 format for ProLogic decoding to the center channel. It's a dated soundtrack, with quite a bit of hiss and some annoying low-frequency hum, but the transfer to DVD is of good quality, with competent frequency and dynamic range. The sound design is often subtly impressive, with echoing footsteps and other incidental sounds well rendered in the digital domain. Not a state-of-the-art presentation, but the DVD represents the original French-language soundtrack accurately. Filmographies cover star Gérard Depardieu and writer/director Bertrand Blier, though no biographical information is provided. The Production Notes section is really a single screen of high-level credits. An interactive Trivia feature is a novelty for the Fox Lorber studio, whose discs are generally limited to trailers and other simple extras. The implementation of this "trivia" quiz is cannily deceptive and very appropriate to the film—a brief (unsubtitled) clip is shown, followed by a philosophical question purportedly based on the film. One soon realizes, however, that there ARE no correct answers to these questions—each available choice for the first question simply leads to a different second question, and all paths lead to the same concluding film clip. It's brief—there are only two questions and three possible paths to explore—but it's a clever addition and a nice surprise from Fox Lorber. Buffet Froid is a black, black French comedy about urban soullessness and the dehumanizing effect of modernization. It's not terribly funny nor memorably sharp-witted, but it's an interesting take on the human condition; Fox Lorber's DVD presentation is unimpressive but watchable. Worth a spin for the adventurous.